The past few sessions of our Hangouts gaming group have been just me and one player (Kevin Cook), so the OD&D campaign was put on hold and we looked for something that would lend itself to quick solo-gaming. On an impulse I grabbed The Lamia’s Heart, an Astonishing Swordsmen & Sorcerers of Hyperboria adventure for low-level thieves (2-5 0-level thieves) that is in AFS #4. Instead of running it with the AS&SH rules, we decided to run it with the Scarlet Heroes rules. One of Scarlet Heroes’ selling points is that you can run modules from other OSR games essentially unchanged with a lone PC, and I am happy to report this is true. The adventure itself is meant for one or two sessions – we finished it in about four hours total (that is one of the advantages of playing with a single PC, decisions and the mechanics of combat and skill checks go much faster with just one player). You can layer the core mechanics on top of pretty much any old-school rule system, so we certainly could have used AS&SH if we wanted to, but the Scarlet Heroes rules are both clear and concise and make this a fine RPG in its own right. Kevin rolled up Jiro the Thief and after getting the backstory out of the way, he was into the action, staking out a Merchant’s mansion over several nights. He had to find a way over the fence, and also had to avoid the dogs and guards, and somehow get into the mansion in order to steal the Lamia’s Heart, a valuable Topaz. Doing so would impress the head of a fledgling thieves’ guild, and easily gain him membership. Play progressed smoothly – we had to refer back to the rules a few times to clarify a ruling or two, but as I noted above, the rules and examples are clear and there were no problems. When the adventure was over, we decided to continue playing Scarlet Heroes during sessions with just the two of us. The rulebook is full of advice and resources for creating adventures, including a gazetteer of the Red Tide campaign world, a unique bestiary and spell lists. 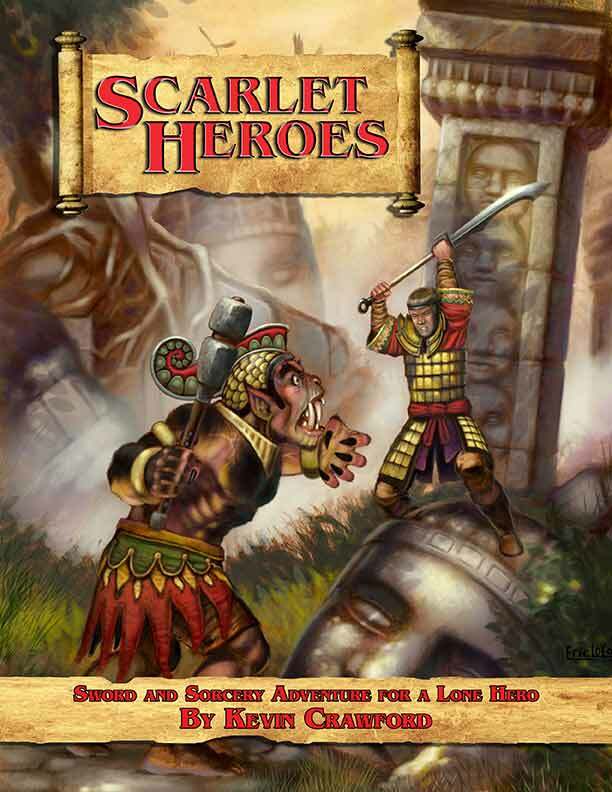 If you just want to try Scarlet Heroes, there is a free quick start rulebook. Yes, a higher-level PC would work, although you still might have to modify the stats or encounters in the module to be a reasonable match. Or just toning down the encounters on the fly is possible, although it takes some experience as a GM with the given system to do that. This is easier if you just want to play and not worry about it.